Super Magnets are made of neodymium, the most powerful magnet material in the world! The largest size shown here is only the size of two dimes, but strong enough to hold a 1/4" thick pad of 3" x 3" sticky notes to a metal filing cabinet! 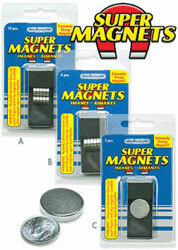 Super Magnets are great for projects that require extreme strength in a small size; or simply to amaze friends. Due to the extreme strength, these magnets are NOT FOR CHILDREN, because they can pinch fingers. The perfect solution for attaching an object to a glass surface such as a storm door or store window. Attach one magnet to each side of a window, and this two-part magnet will attract through glass. It can be used to hold signs or decorations on a single pane glass. It can also be used as two single hooks on a metal surface. Comes with mounting hooks for both magnets and a protective coating to prevent scratching.